the greener side : All that glitters isn't green, but this jewelry is. All that glitters isn't green, but this jewelry is. I'm not big on jewelry. Note the $2 tin ring that I bought in Cozumel in high school my first trip out of North America. Other than that, I'll wear pieces that were worn or given by people I love. But after a recent visit to an Oak Park, IL, bead store and the splurge it provoked, I'm left with hundreds of dollars' worth of unstrung Czech glass, Swarovski crystal, silver, wooden, dyed coral, wannabe pearl, jade, and vintage mid-century plastic beads, plus the wire and sterling clasps. I even spent a full day exploiting the worskhop table at an SF bead shop, crafting necklaces for my cousins for Christmas. While I waited two hours for a jump after my Zipcar battery died another day, I kept popping back into General Bead down the street, where the shopkeepers' rainbow hairdos match the beads. You can see sunsets in the jasper and wear ancient history with the dinosaur bone fossils within Kirsten Muenster's strikingly modern, one-of-a-kind necklaces (left, above), rings, and bracelets. Lucina uses fair trade beads, such as Colombian red choclo seeds and vegetarian ivory, which add an earthy touch to the company's elegant, sparse pieces. How about an espresso pearl bracelet (below, right)? I also like 19 Moons' funky brooches (above, right), bracelets, and picture pendants, which embrace imagery from the Victorian and atomic eras. K. talis's North Carolina maker keeps old-fashioned, protective talismans in mind (right) when crafting wearable art from lost keys, shoe buckles, and other detritus. Viva Terra sells nice green jewelry, housewares, and other stuff. Vik Jewelry's fun Indio collection sources materials from Brazil, including dyed acai seeds (left) and feathers. Yvette Doss hand-crafts pendants (right) with semi-precious stones and recycled doodads such as Mexican milagros for her Yew Tree necklaces. By the Sea Jewelry uses softened sea glass in teal, seafoam, cherry and other hues. My favorite necklace pendant was a thousand year-old Roman coin I picked up in Jerusalem, but beware of looted and fake antiquities. At the Green Festival, Moonrise Jewelry sold beautiful necklaces with real orchid pendants (left) dipped in resin. Vortex Green Jewelry's artists design pieces with lots of recycled beads. They also guide tours of Sedona, Arizona. Motherboard Inc.'s cufflinks are the ultimate accessory for the nerd who is taking over the world. Castaway's bold wood, leather, and horn designs aren't for the faint of heart--but you'd never know that these mature pieces are all sourced from castoff materials. People make jewelry out of practically anything--like bike chains, gumball charms, and vinyl records. Verde Jewelry makes use of Timber Bamboo and vintage baubles (left). 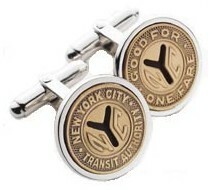 Transit tokens, dice, and Scrabble letters become cufflinks and rings thanks to tokens & coins(right). I used to glue quarters to my barrettes (don't ask). Japan's Harvest even sells jewelry made from old skateboards--supposedly. That part of the site is under construction. Israel's Ayala Bar costume jewelry involves lots of recycled goods. If you're making jewelry and need a sustainable silver source, Cloth of the Gods from Yellow Springs, OH (the original Twilight Zone) sells silver beads and more from tribes in Thailand. Making a commitment? Skip the blood diamonds and the greed-gold. Brilliant Earth offers a line of fair trade, conflict-free diamonds. Sumiche Jewelry, fair-trade certified, is the work of an Oregon couple, Susan and Michelle. Leber's Earthwise Jewelry makes use of Canadian diamonds and fair trade ingredients. Green Karat sells engagement-ready, ecologically-sensible stuff (left). The Ringworks Studio in Puget Sound focuses on conflict-free gold as well as diamonds. Rather knock on wood than rocks? You could get a custom-crafted wooden ring made in Vancouver with all sorts of sustainbly-harvested trees such as cherry, the tree of the heart, or pine, which represents peace. Steve Wiser of Wiser Jewelry crafts pendants, engagement rings, and other 18 karat golden things from recycled gold in a Washington state studio that will soon be solar-powered. Update: Another option is to check out synthetic diamonds, which cost 10 to 15 percent less than those from open pit mines. Companies like Apollo, Chatham, and Adia are cultivating gems in labs. Major jewelry sellers such as Tiffany & Co., and even Zales are signing on to support less brutal ways of mining precious gems and metals (Find out more from the Council for Responsible Jewellry Practices.). That won't stop companies' brutal marketing campaigns that shove diamonds in our faces. I couldn't think of a much emptier symbol of enduring love than a colorless cut rock. How about a blue sapphire instead? 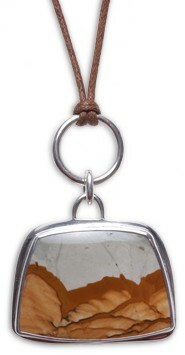 For more, Happy Hippie offers a good list of eco jewelry. Inhabitat has some other ideas. So does Delia at In Business. Don't ask how I sat through this movie, but the guy character in "How to Lose a Guy in 10 Days" dreams up an ad campaign for diamonds with the tagline, "Go frost yourself." No mention of blood diamonds there. Indeed, you'd have to have frost in your heart to treasure some ritzy rock that people across the world lost their limbs to bring you. I think that you know how to make people listen to what you have to say, especially with an issue that’s so important. I am glad to see this blog. Two big thumbs up, man! This article feeds into my common discontent using the APR process. I wish that PRSA updates their test to fit the rapidity with which the community relations occupation is changing. The fundamental constructing blocks of PR instruction aren't constantly suff. I'm used to for a long time a person can meet him everything changed. . . Now I'm here as the same. I really enjoy your site .. I've shared a lot about your facebook account. I have to admit. Those are pretty looking jewelry right there. Who would've thought that jewelry can be made green? Whoever thought of this idea deserves praise! I was thinking of starting my own accessory business, but I lacked the confidence to take the risk. Well, this time, I guess I'll give it a try now that my friends have told me that they'll help me in my venture. Some of them will do the accounting using a software from the Peachtree Quantum series, the Peachtree Quantum 2011. Some of them will help make the accessories. I will do all the paper work and all that legal jazz. Anyway, thanks for sharing! I hope I can wear one of those green jewelries soon! I think it's a great idea with room for personal creativity. You can use any frame you want in a size that will hold all of your jewelry, and you can make it look like art. The post shows that the writer has done a thorough research and very knowledgeable about this topic. I hope to read some more of your post in future. This is a very impressive blog and some good ideas in your post. Thanks for your sharing. I review the article and find some extra ordinary design work. As per current trend diamond jewelry is the biggest attraction in weddings occasion. We make natural sea glass jewelry from old recyled glass that has been worn and smoothed by the oceans wave and sand and delivered onto the shores in a beautiful glistening gem. We then take these natural sea glass pieces and combine them with sterling silver and other elements to create one of a kind sea glass jewelry. We have spent years picking up beach treasures from the coast and during our beachcombing expeditions we try to help keep the beaches clean by picking up other debris left by tourists or washed in by the tides. Even though the garbage pails are readily available at many coastal locations, it does amaze me how people can leave so much trash on the beach. What's the best hungary university for studying Medicine ?? and do I have to study hungary language ? I need a university which I can study Medicine with English and not with any other language !!! I think eco jewelry is going to become very popular. If you are looking for simulated diamonds AND a custom designer...talk to Rebecca at www.birkatelyon.com. She works with mostly cubic zirconia diamond rings -- especially engagement rings. There's also some decent CZ rings at overstock.com and other large seller sites like that. Hey ! am I glad to vist your blog ! from this I can get some information that I didn’t know before. You made my day. Lovely collection ! I liked it very much. All the jewelry shared by you is exclusive one. Is it designed by you or you have bought it somewhere. Love the necklaces. They are very elegant. Love the dyed acai seeds, those will make very nice bracelets. Better to wear a ring, necklace or bracelet that someone had deliberately and emotionally gave you, or even made you with time and thought invested. But really, no need to exaggerate, if one's not good in craft works, it's better to buy something made by others :) The main thing is the intention!